Dropbox is very popular service for free online storage with premium features. You can upload and store documents, photos, files in your Dropbox storage. Everything added to Dropbox account can be accessed easily on computer, mobile phone and directly through Dropbox website. Overall a neat user interface allow quick and easy sharing of Dropbox stored files and data. By default, every user get 2GB of free Dropbox storage space. However, you can get and add more free space to Dropbox account without spending any money using either of following methods. Add more space in Dropbox for Free: These work! 1. Refer a friend for 16 GB free space – Invite your online friends to join Dropbox and you get 500MB for every referred friend upto 16GB in total free space through this referral method. Goto dropbox.com/referrals and directly invite Gmail friends or manually enter email IDs for sending invitation. On the same page you can see number of MBs or GBs of free space added through friend referrals. 2. Mailbox app for 1GB free space – Download Mailbox app (mailboxapp.com) from iTunes store on your iPhone or iPad device. Then connect your dropbox account in Mailbox app settings and you get 1GB free space directly. Super easy method for iOS users for sure. 3. New users get 250MB free space – New users can easily add 250MB free space to existing storage by going through “Get Started” steps. Open dropbox.com/gs and complete any 5 out of 7 listed steps including: Take the Dropbox tour, Install Dropbox, Put file in Dropbox folder, Install Dropbox on other computer for use, Share folder with friends, Invite someone to Dropbox and Install Dropbox on mobile phone. 4. Social connect for 125MB each free space – Connect your Facebook account with Dropbox to share folders with online friends and get 125MB free space. Follow Dropbox on Twitter and connect Twitter account to invite friend to Dropbox with tweet to get 125MB + 125MB free space. 5. Dropbox feeeback for 125MB free space – Open dropbox.com/getspace and click “Tell use why you love Dropbox” button. 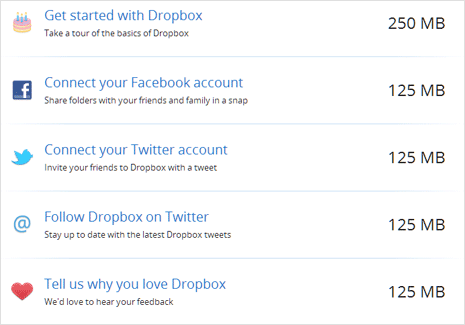 Write feedback of Dropbox experience and you get additional free 125MB of space.